Comet C/2013 UQ4 shines in this image taken on July 7, 2014. 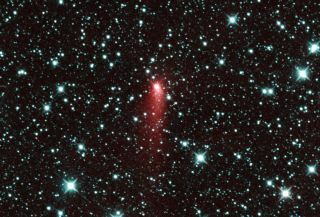 A previously unknown "asteroid" spotted by a NASA telescope is actually a comet, according to recent observations. NASA's NEOWISE space telescope, which started its newest near-Earth object-hunting mission in 2013, spotted what scientists thought was an asteroid two times in 2013. Researchers thought it was an asteroid because it didn't appear to have a coma (a halo of fuzziness surrounding the object) or a tail — telltale signs of a comet. But all that changed with a follow-up observation. In addition, astronomers have learned that the comet takes 450 years to orbit the sun, and that it moves through the solar system in the opposite direction of the planets, like a car going the wrong way down a one-way street. NEOWISE itself is a new incarnation of the WISE (Wide-field Infrared Survey Explorer) telescope, which began its mission in 2009 by scanning the sky for asteroids, brown dwarfs (dim, failed stars), and galaxies. In September 2013, though, NEOWISE was awoken and given the task of searching the solar system for comets and asteroids that might threaten Earth. Its new mission is expected to last three years. During that time, the spacecraft will measure the diameters of objects that it finds, and determine their albedos (how much light they reflect). Follow Raphael Rosen on Twitter. Follow us @Spacedotcom, Facebook and Google+. Original article on Space.com.